(Newser) – Late last month, Arizona Rep. Raul Grijalva penned an op-ed asking Interior Secretary Ryan Zinke to step down from his post due to a swirl of "scandals and nepotism." It looks like Grijalva is getting his wish: Per Bloomberg, sources reported that Zinke told the White House he's out, and that his formal announcement on his departure would come Wednesday. However, the Bloomberg report was confirmed just a few minutes after it broke Saturday morning by President Trump himself, who tweeted that "Ryan has accomplished much during his tenure and I want to thank him for his service to our Nation." 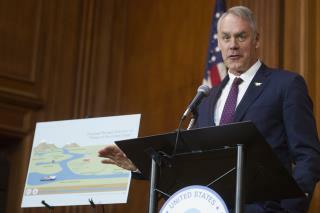 The president added that a new interior secretary would be announced sometime next week. Trump didn't indicate whether Zinke had resigned or been fired, though Bloomberg's sources say Zinke "quit." Trump always thank the outgoing for what they did but we the public have no idea what they did. Summarily fired, another one. Doesn't surprise me. If he had stayed, the democratic house would have launched very investigations into a lot of his suspicious activities. I think he was nudged out by the Trump administration, because they didn't need one more headache with his suspicious activities.